There are many ways to mess up an outdoor lighting installation. Most pros warranty their work. They also know the installation pitfalls and realize the value of doing the job right the first time. Waterproof connectors with sealant should be used in every outdoor lighting installation. Every week we see mistakes made by do-it-yourselfers. These mistakes can drastically reduce the lifespan of a system but they are also easily avoidable. We’ve put together a list of the biggest and most common mistakes we see in our outdoor lighting installation travels. Take care not to make these mistakes and you’ll be much closer to a long-lasting outdoor lighting system. Even if you’re planning to use low voltage requirement LED lamps, you’ll want to use a good direct burial 12-2 gauge wire. Direct burial wire will keep moisture from getting into the copper wire this extending the life of your system. 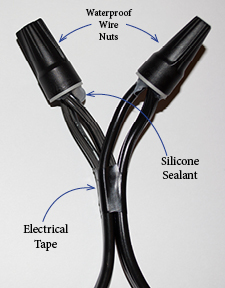 Wires should be connected with waterproof connectors that have a silicone sealant. Wires should be taped together with electrical tape to keep them from getting pulled apart by accident. Do not succumb to the temptation to use piercing type connectors. They are subject to moisture, which will cause a connection failure. They also have very little metal-to-metal contact so the slightest change in the condition of the connection could cause premature failure. We recommend wire nuts filled with sealant. Also keep your wires from being accidentally pulled out of the nut by placing a zip tie or electrical tape around the wires a few inches from the wire nut. It is a must to use a multimeter to ensure you have balanced and correct power to every fixture. A multimeter will help you track down and identify voltage issues. A professional would never attempt an outdoor lighting installation without a multimeter. Make sure you balance your system and design your hubs so you are evenly distributing power to each fixture. Fixtures with too much or too little power may perform poorly and have a reduced lifespan. LED lamps have a lower power draw so if you’re installing a LED system your job will be easier. But long wires also drain power so you’ll likely need a multi-tap transformer to ensure correct power to every fixture. Think about those who will come behind you. Don’t install fixtures where landscape maintenance employees will be working every week. You’ll need to keep the fixtures (and wire) away from where they can be damaged by lawn mowers, string trimmers and edgers. Also try to place the fixtures where contact with fertilizer and other chemicals will be minimized. Keep the fixtures hidden as much as possible. Remember the focus of outdoor lighting installation is on the subject and not the fixture. Be careful of light trespass. As much as you want to focus on your property you don’t want light spillover to your neighbor. Use only moisture sealed, solid brass fixtures. Outdoor lighting fixtures get much more abuse than one would think. Purchasing and installing high quality fixtures will not only ensure high quality illumination but they will outlast the typical big box fixtures. If you’d like professional help with your outdoor lighting installation get in touch with us. We’ll give you a free no obligation written estimate and back it up with our unmatched lifetime warranty on parts and installation.